Almost everyone in America has heard of Anna, the famous upper class English lady who held her own with the King of Siam. What most people haven’t heard is the real story behind the better-known, fictionalized character. Susan Morgan has devoted over a decade to fleshing out the life of Anna Leonowens in Bombay Anna. This was not an easy job given the lengths Anna went to alter her past, even writing a false biography for her grandchildren. Contrary to Anna’s claims of an upper class English upbringing, she was actually a mixed-race child born in India to a mixed-race mother and a low-ranking English soldier. She grew up in tented barracks and among the local children. Her intellect and facility with language set her apart. When her husband, the love of her life, died, Anna faced limited prospects as a widow. For the sake of her children, she moved to Singapore, where no one knew her, and cleverly recreated her past. Morgan shows the readers how successful Anna was at reinvention. Not only did her story hold, but her children moved freely among the upper classes, and her grandchildren attended prestigious universities. Morgan’s painstaking research is clear, and her devotion to this topic comes through in the book. 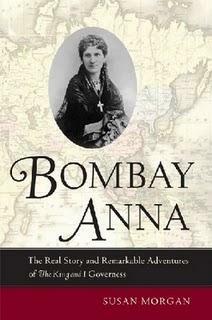 She describes the stages of Anna’s life with precise detail, sometimes more than a general reader may need, but Bombay Anna serves the dual purpose of bringing the real Anna to life for pleasure readers and providing a treasure trove of facts for historians and scholars. Morgan even provides a brief biography of Margaret Landon, whose book (Anna and the King of Siam) catapulted Anna Leonowens to fame. Often times, such fact-laden books can be cumbersome to read - not this one. Morgan writes skillfully, and Bombay Anna often reads like a novel. By the end, the reader holds an intimate knowledge of Anna and may even regret not having been able to meet her. Anna was a woman ahead of her time. She refused to live her life subject to racial discrimination and social constraints, and adapted in order to overcome a system designed to hold her back. Anna rejected proselytizing in favor of respect for world religions, she had a strong social conscience, and she valued education more than anything else. She could make herself comfortable among a wide variety of people – from Russian peasants to residents of the king’s harem and Siamese nobility to American literary intellectuals. See the movie with Jodie Foster. Enjoy the musical. But if you want to know the real story, pick up Bombay Anna and be prepared to find an inspiring story of an incredible woman. As always-the true story is the better !! After reading your wonderful review, I will definitely check out this book!